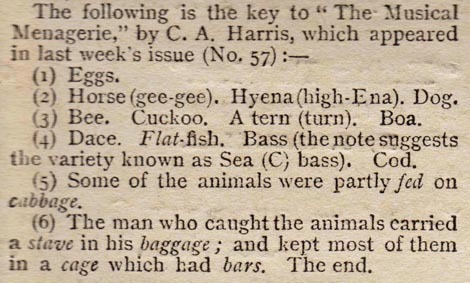 Also published in Issue 57 was a musical based quiz – this is reproduced on the Editorial Extracts page. Just in case any readers should have difficulty with this, here are the answers, which appeared in the following week’s issue. 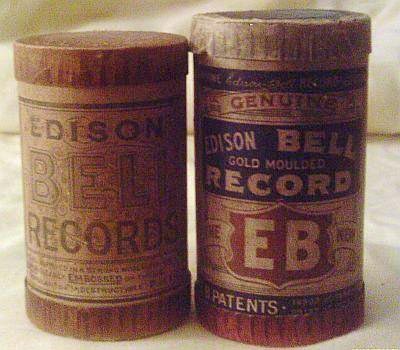 The “record” the editor refers to would have been a cylinder, as Edison Bell did not make flat discs until 1913, although they had been developed by Berliner in the 1890s. There were three main producers of recorded music in the early 1900s – Edison, Columbia and Victor. The cost of players varied from 45 shillings in 1904 for the cheapest Gem machines, while the Standard was advertised at £4 4s in 1905. Recordings tended to be of the most popular songs and artists, since the range of what was possible to record was limited to the “loud and distinct”. 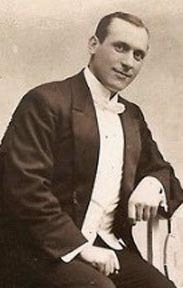 Stanley Kirkby was a variety artist known for his very pure baritone voice and clear diction, ideal for the recording techniques of the time. He was extremely prolific and very well paid, working for most of the companies, using him own name as well as many pseudonyms. I grew up knowing this as a household scouring powder, and one to be kept away from too much skin contact. Very surprised then to see it advertised in MHJ originally as a hand cleaner! Even more surprised to find that according to the Guardian (https://www.theguardian.com/artanddesign/2008/sep/09/bacon.art) Francis Bacon used it as a toothpaste! Vim was one of Lever Brother earliest scouring powders, introduced in 1904 as a related product to their Monkey Brand soap. Unilever dropped it in favour of its Jif, later Cif in the UK, but it is still available in some parts of the world. The letter from JR Crewe published in Issue 42 on 16th August 1905 illustrates the typical market for the MHJ. James Richard Crewe was born in 1868 in Carlton, Yorkshire. His father was a twine maker, who moved to Methley as a coal miner, a job Crewe also went into. The 1901 census shows him living in the village among the usual range of miners and agricultural labours. By 1911 however he and his family are living in Pinfold Lane, Methley and his job is described as Colliery Deputy, Below Ground. This job held a unique and often contradictory position as it was the most junior management role while also being the most senior underground position. I do not know at what point Crewe obtained his music diplomas, but as the letter to the Editor was published in 1905 it would perhaps be reasonable to presume it to have been during his younger years. This suggests he grew up in a working class family interested in education, and by some means or other able to afford perhaps one of the newly available, cheaper upright pianos described elsewhere on this website. The interest in music is shown by the fact that the family address in 1911 is Mendelssohn Cottage. Furthermore, the youngest son was called John Mendelssohn Crewe. Crewe died in 1929, and details of the sale of the property showed it to be rather more than a typical miner’s cottage, including basement, two living rooms, kitchen, scullery, pantry, three bedrooms, boxroom, garage and greenhouse. The agent also describes it as being in “a good residential locality having a good class of occupier owners”. I have recently acquired a copy of Issue 88, which was missing from my bound copy of Volume IV. 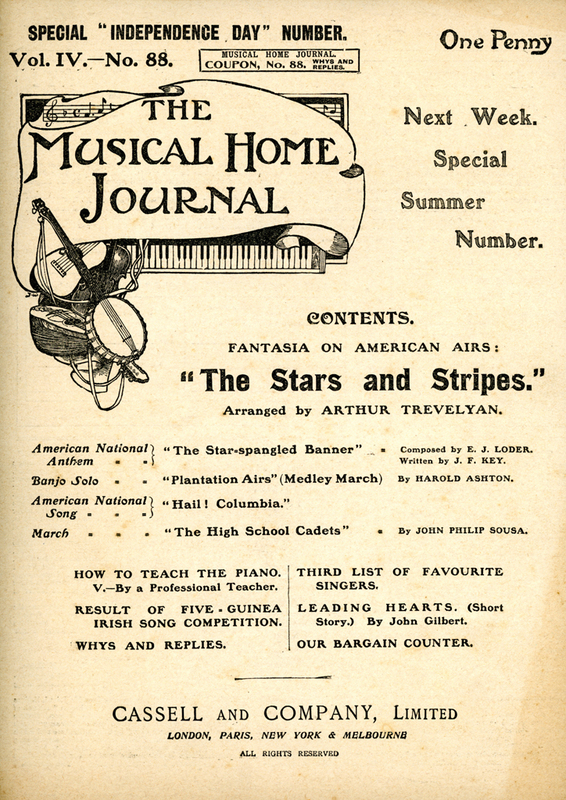 Published on 4th July 1906 it is perhaps not surprising that it had an American flavour, including, The High School Cadets, a March by John Philip Sousa, and The Stars and Stripes – a Fantasia on American Airs, arranged by Arthur Trevelyan. 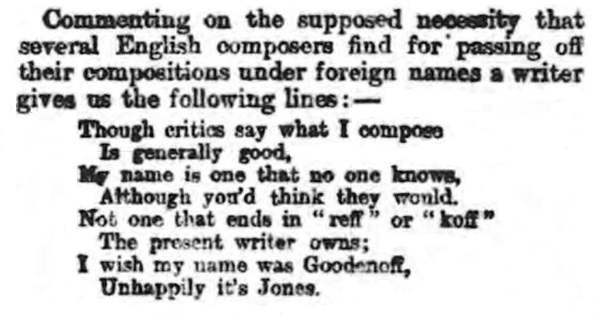 In Issue 38 of 19th July 1905 the Editor referred to a letter from a junior reader, a Eugene O Forrest, who had successfully passed a number of piano examinations. Eugene Oscar Forrest was born in 1891 in Plympton, Devon, and when he entered Stockwell School in Lambeth in 1897 his parent/guardian was recorded as Amy Parks. Forrest went on to achieve Associateship of the London College of Music in 1911. There are a few newspaper reports showing that Forrest acted as accompanist, including at a concert for the wounded in Aldershot in 1915, but he does not seem to have had a career as a professional performer. He married Alice Tong in 1924, and I believe they had a daughter, Shelah, born in 1930. At the time of the 1939 Register the couple were Postmaster and Mistress, running a Post Office, Tobacconist and Confectioners in Mayplace Road, Crayford. Skilled amateur musicians often contribute greatly to the musical life of their communities, so although I have no information to prove it, I like to believe that this would have been the case with Forrest. He died in 1947. Added a new page, under Composer Biographies, detailing the pseudonyms used by many composers. Two very well-known food and drink products, advertised in June 1905. George William Plumtree was born in Lincoln in 1852, the son of a local grocer and tea dealer. He established a business as a Manufacturer of Preserved Products in Southport. I have been unable to find much information about the business, possibly because Southport was established as a seaside leisure resort at the end of the 18th century when sea bathing became fashionable. An article in the Manchester Courier in 1909 cited the lack of manufacturing in the town, Plumtree’s apart, as a bonus for the area. Plumtree senior died in Southport in 1903 and I imagine the business was inherited by his descendants as most of his family seemed to be employed there according to the 1901 census. Plumtree’s were especially well-known for their potted meats referred to in this advert, and many of their glazed ceramic pots have survived, but I have been unable to find any other reference to these jellied products. The advert for Red, White and Blue coffee is unusual in that it does not mention a manufacturer or supplier, which suggests it must have been extremely well-known at the time. It was a dried coffee and chicory mix made by Hansons of Eastcheap, London. Samuel Hanson & Son was established in 1747 as a wholesale Grocers, Tea, Fruit and Wine Merchants and remained in the family through several generations. At the time of this advert the business was run by Sir FS Hanson, Alderman of Billingsgate, later to be Sheriff of London. He had inherited in 1905 from Sir Reginald Hanson, who had been Lord Mayor of London from 1886 to 1887, and had represented the City of London in Parliament from 1981 to 1900. The coffee tins shown on the Adverts page probably date from a later period, possibly the 1940’s. special edition to mark that month’s Royal Wedding. Chapel, Windsor on 15th June 1905.
special issue as part of their celebrations. From June 1905 the Editor offered a variety of competitions. In issue 32 of 7th June that year two were running, having been first announced the previous week. The first was to compose a waltz suitable for publication in MHJ, while the second was to design a program of twelve pieces from all previous issues suitable for a musical evening. I do wonder if readers in 1905 would have been aware that the Editor’s positive comments about the response to these competitions would have been written several weeks before their first publication?